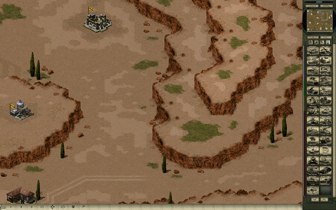 Here is a preview of the new desert terrain I've been working on. Most of the RA2 tile sets have been reskinned, but there are lots of new sets that I still want to add. 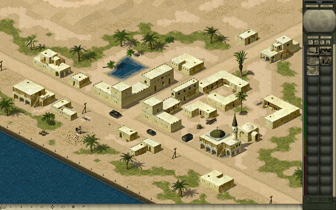 Part of a new map based on the Suez canal, it's the first new desert map & still very much a WIP. One of the standard RA2 maps so ignore the buildings & trees, but shows the new cliffs well. Why is there ore in the first picture though? It's all still a work in progress, I wasn't planing to post anything until it was all done but Lee asked about the Desert terrain so I thought why not post a preview. I see. I thought you decided to throw in some rare ore mines in the end. Good lord that looks amazing. Now that's pretty damn cool, even if it's just a small teaser of what is to come. Interlaced JPEG's are so ..dunno...90's/early 2000's. I know it lets you see the approximate full picture sooner and is in one way a better choice but I hate waiting for the image to sharpen more than waiting for the rest of the image to appear. Now, you ripped out buildings, but didn't rip out the fences? Trampling those was half the fun! But it brings back such fond memories. Of walls. And then finding out that there was plenty of infantry behind them. But speaking of ripping things out, you are going to use the terrain objects as well, I assume. Or I'd say rather, I hope.